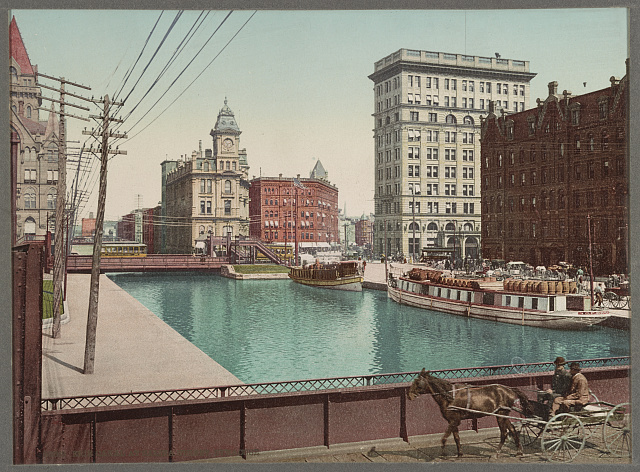 Erie Canal at Syracuse, from Library of Congress, at loc.gov. The U.S. has always been a nation of innovation, and many of its greatest achievements have originated in New York City. But it was the imitation of a Chinese success that may have put New York on the global map. Better known for his invention of the steamboat, Robert Fulton was an early advocate of the Erie Canal, a waterway that connected America’s populous eastern seaboard with the western territories (at that time, to the Ohio Valley and eventually beyond). George Washington had also thought a canal might unite his new country, but the Potomac River was too difficult to navigate and did not extend far enough west. Once the Hudson River was connected to America’s Great Lakes, New York City became the Atlantic port of the Erie Canal and New York the Empire State. Rome, New York, that is. It was in this town that construction on the Erie Canal began on July 4, 1817. Rome was chosen because it was the easiest place to start – no lock or aqueduct would be needed for 130 kilometers (80 miles). The canal measured 12 meters (40 feet) wide at the surface, 8.5 meters (28 feet) side at the bottom, and 1.2 meters (4 feet) deep. The full canal was equipped with 18 aqueducts and 83 locks, each typically measuring 27 meters (90 feet) by 4.6 meters (15 feet). It stretched 584 kilometers (363 miles) from a point near Buffalo to the Albany area, taking advantage of the Mohawk Valley as the best route for crossing the Allegheny Mountains. It was completed in October 1825. The Erie Canal was built in many small segments. Contractors were mainly local; they brought their own tools, hired their own laborers. Contrary to popular belief, over 75% of the workers were American-born, supplemented by Irish immigrants. Originally a slang word coined in Britain when canals, sometimes called “eternal navigations,” were being built, Erie’s “navvies” were a scrappy lot who learned to live on the worksite, picking up skills as they dug the canal. These same workers would later be in high demand when the railroads were being built. Why? Organizational skills, with emphasis on teamwork and coordination. DeWitt Clinton, from Library of Congress, at loc.gov. The Erie Canal takes its name from Lake Erie, which the waterway connected to the Hudson River, and thence to the coastal port of New York City. But perhaps the route should have borne the name Clinton. 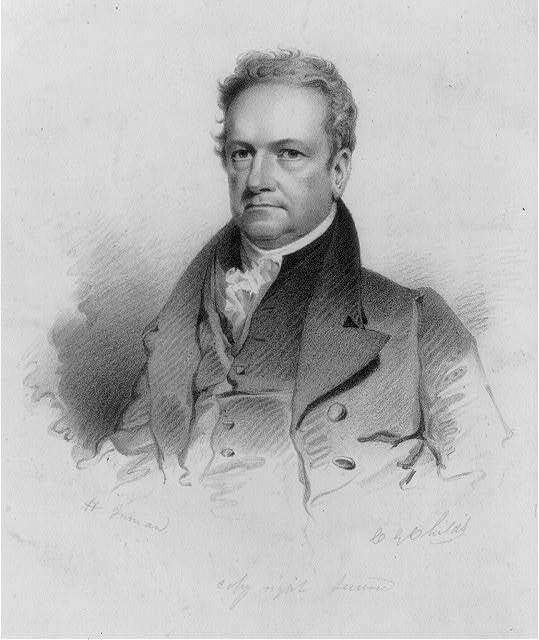 Credit for building the Canal, more than to anyone else, goes to DeWitt Clinton, a politician who served several years at first a state senator, a U.S. senator, mayor of New York City, as well as governor of New York. He also ran for the Presidency, but was defeated by James Madison in the 1812 election. Clinton was passionate about the route, seeing what it would do for New York, both state and city. When Clinton was elected governor of the state in the spring of 1817, he was finally able to authorize the project, and on April 15 of that year, the New York legislature provided financing for the estimated cost of $7 million. Although the project was called “Clinton’s Ditch” and sometimes “Clinton’s Folly,” naysayers were soon proven wrong. The canal was a great success. The Erie Canal reduced travel time in half, and slashed shipping costs 90%. The typical cost for moving goods over land was $100 per ton; via the canal, the cost was $10 per ton. Within 10 years of the canal’s opening, that cost had further dropped to $4 per ton. Tolls collected recouped construction costs in less than nine years. By 1882, the Canal was so successful financially that tolls were abolished altogether. In the first year, 2,000 boats, 9,000 horses, and 8,000 men were involved in transporting goods on the canal. By 1845, a million tons of goods were carried on the canal – each year. Erie Canal System, from eriecanal.org. The Erie Canal connected the Great Lakes of the United States to the Atlantic Ocean. Both waters were affected by this link. Eventually, the entire canal became part of the St. Lawrence Seaway when Calumet Harbor was completed as the port terminus in Chicago, making it one of the world’s largest inland ports. Perhaps most dramatic was the effect of the Canal on New York City. Just 15 years after the Erie Canal’s opening, New York City ranked as the busiest port in the United States. Some say that New York City surpassed Boston and Philadelphia as the leading American city precisely because although these eastern cities also had deep ports but only New York had access to the West, via the Erie Canal. An Act Respecting Navigable Communications Between The Great Western and Northern Lakes And The Atlantic Ocean. WHEREAS navigable communications between Lakes Erie and Champlain, and the Atlantic Ocean, by means of canals connected with the Hudson River, will promote agriculture, manufacture, and commerce, mitigate the calamities of war, and enhance the blessings of peace, consolidate the union, and advance the prosperity and elevate the character of the United States…there shall be constituted a fund to be denominated the Canal Fund, which shall consist of all such appropriations, grants and donation, as may be made for that purpose by the Legislature of this state…and for the payment of the interest, and final redemption of the principal of the sums to be borrowed by virtue hereof, there shall be and hereby are appropriated and pledged, a duty or tax of twelve and an half cents per bushel upon all salt to be manufactured in the western district of this state; a tax of one dollar upon each steam boat passenger for each and every trip…after deducting thereof twenty-three thousand and five hundred dollars annually appropriated to the hospital, the Economical School and the Orphan Asylum Society, and ten thousand dollars hereby appropriated annually for the foreign poor in the City of New York. – From Laws of New York, 40th sess. (1817), chap. 262, pp. 361-65. See also Davidson and Lusk Brooke, Building the World (2006), Vol. I, pp. 163-168. Tolls Supporting Charities: The Erie Canal may be one of the first infrastructure projects to designate charitable contributions from user fees. The legislation calls for support of a hospital, school, orphanage, and the “foreign poor in the City of New York.” Is the practice of linking a percentage of tolls or other revenues to charity followed today? CIOCS’s special interests include climate-induced changes in marine and coastal community ecosystems. Connecting the water systems of a country (or region) with the oceans can produce benefits but also threaten sensitive environments. How do such connections influence New York harbor, the Erie Canal, the Great Lakes? What about the St. Lawrence Seaway? Allen, W.B., ed. George Washington: A Collection. Indianapois: IN: Liberty Classics, 1988. Hawthorne, Nathaniel. “The Canal Boat.” New-England Magazine, no. 9 (December 1835): 398-409. A story written by the famous American author telling of his own trip on a canal boat in 1835. The text can be found on the University of Rochester History Department canal website: http://www.history.rochester.edu/canal. Hecht, Roger W., editor. The Erie Canal Reader, 1790-1950. Syracuse, NY: Syracuse University Press, 2003. Contains poems, essays, and fiction by American and British writers about the Erie Canal. Krause, Jeanne. “The Erie Canal: Macro-engineering When the World Was Still Simple.” In How Big and Still Beautiful? Macro-Engineering Revisited, edited by Frank P. Davidson, C. Lawrence Meadow, and Robert Salkeld. Boulder, CO: Westview Press, 1980. Stein, Charles. “Be It Ditch or Dot.com, a World of Growth.” Boston Globe, January 23, 2005. For a timeline, see: http://www.eriecanal.org/UnionCollege/timeline.html. For an overview, see: http://www.nycanal.com/nycanalhistory.html. For the United States National Canal Museum, see: http://www.canals.org.